Managing migraine pain is a complicated process — there are many options and no one-size-fits-all treatment. Though results vary for each sufferer and even each migraine, the main ways to treat migraine pain are abortive, preventative and alternative treatments. The effectiveness of each treatment is individual and there is a vast number of migraine pain relief options out there. Abortive medications are used to stop or slow symptoms of migraine and pain once a migraine has begun. There are many migraine pain relief options out there, both over-the-counter and through prescription. 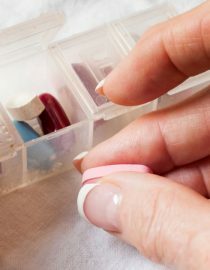 The daily and frequent use of over-the-counter medications may cause stomach issues, rebound headaches or ulcers, so be cautious when taking these medications. I personally suffered from rebound headaches after extended amounts of time using over-the-counter medication. I was using more medication to treat the rebound headaches, which perpetuated the cycle. Once I realized the complications with the medications, I stopped using them. Triptans are a prescription option for managing migraine. The medication constricts blood vessels in order to block pain and pathways to the brain. Since many migraine sufferers experience gastrointestinal difficulty during a migraine attack, triptans are available in pill, spray, or injectable options. I take both nasal spray and injectable triptans to abort a migraine attack. I throw up pills once a migraine attack is in full force, and these options ensure that I am receiving the medication needed. Controlling nausea helps prevent throwing up, so anti-nausea medications are often combined with abortives to keep this nasty symptom at bay. Many migraineurs have reactions and side effects of triptans, so please proceed with care. Steroids may be prescribed to control inflammation — they may not be used frequently and are meant to break a migraine cycle or extended migraine pain. I am very sensitive to steroid side effects, but find if my triptans are not working and I can’t break a cycle of pain, steroids are an option to get me to a more manageable place and provide me with some migraine pain relief. Opioids may be used to treat migraine pain (with caution) for patients who cannot take triptans or other migraine treatments. Opioids are habit-forming and often abused. For this reason, regulations are starting to get tighter, and Opioids are becoming a rare treatment option. This is a frustrating reality for me being I use opioids to treat my chronic migraine. Medications should be used as prescribed, and for me, they are effective when used thoughtfully. Preventative medication is used frequently to prevent the migraine from occurring. The goal of prevention is to lessen frequency, intensity, and duration of migraine. Preventative medication is used for those who suffer for extended amounts of time with no relief. They don’t work immediately; they need to be taken consistently (as prescribed), and may take weeks until prevention is achieved. Anti-seizure drugs are used to lessen the frequency of migraine. The most common is Topamax; though in my experience, I was put on a low dose and kept having to up the amount to prevent my chronic migraines. I eventually went off it because I was experiencing severe brain fog, confusion, and word loss. It is commonly prescribed, but is known for its somewhat extreme side effects. Beta-blockers are used for high blood pressure to lessen the frequency and intensity of migraine pain. Botox (onabotulinumtoxinA) is found to be most effective when given every three months. Botox for migraines is injected into the muscles of the face, neck, and head in those who suffer more than 15 migraines a month. I receive Botox and have found it has lessened the intensity and duration of my chronic migraine after a few treatments. Antidepressants are used to treat patients with migraine who are not always depressed. It affects the serotonin levels and is used to decrease the frequency of a migraine attack. Once again, side effects need to be in consideration with treatment. Non-pharmacological treatments typically need to be combined with medication in order to properly prevent migraines. As with all treatments, individual experiences will vary. Lifestyle needs to be addressed and it is helpful to journal triggers. Consistent sleep schedule, food and drink consumption, stress levels, water intake, weather conditions, and hormonal swings should be documented. Physical therapy, massage, stretching, chiropractic care, and yoga will address muscle tension, movement, and stress. It is important to practice regularly in order to feel the benefits and reduce migraine. I have found that by addressing my muscles and movement, I can prevent migraines a bit and recover from an attack more quickly. I find that I get incredibly tight from being in extended amounts of pain and these techniques help both physically and mentally for pain management. Ancient Eastern medicine, like acupuncture, meditation, and hypnosis have proven to work in some migraine sufferers. Biofeedback and cognitive therapies teach how behaviors and thoughts control how you perceive pain. They are different techniques to monitor and react to physical responses. Supplements and herbs are common treatments for managing pain. We each require certain nutrients to perform best — migraine sufferers often lack certain vitamins or minerals needed for the body to function optimally. Tests can be done in order to find what you need and a nutritionist can help with food-based herbs and sensitivities. A combination of natural and medicinal options is often best when battling migraine pain. Lifestyle changes are needed to live the healthiest life possible, but medications are needed to combat or prevent migraine beyond natural remedies. Side effects are common, and a balance of what works for each sufferer differs. Finding a good combination is not easy but finding ways to battle are necessary. I have found that there is no answer or simple medication to make me feel better. I live a life of constantly trying new things and waiting for my migraine response. It is an ebb and flow and with so many options can seem daunting. I suggest journaling, making a plan, and being flexible with treatment and combinations.